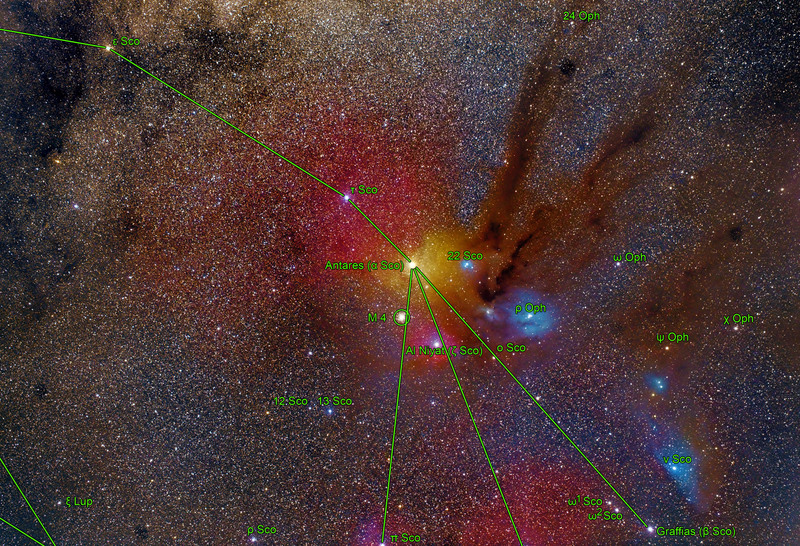 This is one of the most amazing and colorful regions of the entire sky. It contains a vast mix of emission and reflection nebulae, dust lanes obscuring the background stars, and several star clusters. The yellow giant Antares is the brightest star and it is surrounded by an emission nebula (upper left) and a very rare and beautiful yellow reflection nebula (to the opposite side). At four o'clock of Antares is the tripple star Rho Ophiuchus which is surrounded by a large blue reflection nebula (IC 4604). The dark dust lanescan be seen eastwards from this region. The small bluish reflection nebula to the north of Antares is IC 4605, reflecting the light from the 4.5 mag. 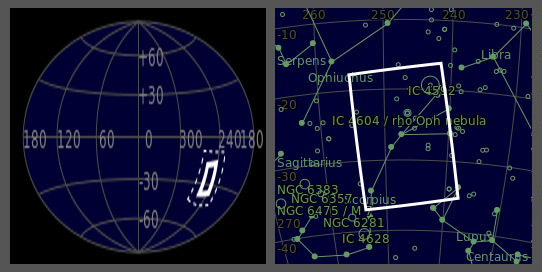 star 22 Scorpious. Ат 6 o'clock position of Antares is the bright star Al Nyat (Sigma Scorpii) surrounded by the bright emission nebula Sh2-9. Just beneath of this can be seen the bright globular cluster M4. Much closer to Antares is the small globular cluster NGC 6144.